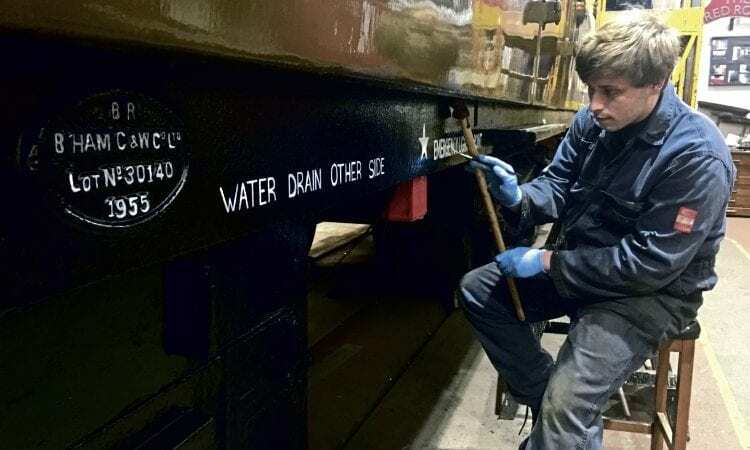 In our latest feature about apprentices at the Severn Valley Railway, we meet 21-year-old George Brogan, who is in his final year in the carriage & wagon department at Kidderminster. 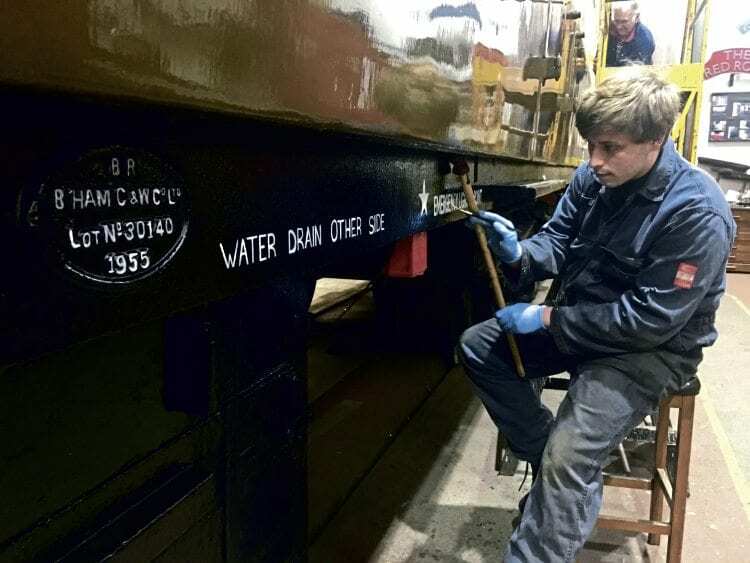 A steady hand is needed as George applies lettering to the carriage. Since July, he’s been working on vehicle No. 80776, a British Railways Mk1 carriage. This innovative project will see the creation of an entirely ‘new’ type of accommodation for wheelchair users. George says: “Painting the exterior has been one of the main tasks. After repairing, sanding and filling where necessary, we had a thorough clean up in the workshop, then tack-ragged the entire exterior of the carriage, using a special cloth to capture the smallest particles of dust. The secret to successful painting is definitely in the preparation. This carriage had some previous coats of paint that we could build on, except where we’d had to go back to bare metal. “We apply one coat of primer, then two undercoats before adding two top coats and finally two varnish coats. At every stage, it pays to get things right. With the primer and undercoats, you sand back if you spot a run, to get the best possible finish for adding the topcoats. You can’t sand back topcoats so you’ve got to get it right at the early stages. It’s all done traditionally with brushes. “You’ve got to get the paint on quickly, then lay it off just as fast to get an area of the coach painted. You make sure that you leave a ‘wet edge’ on the section you’re laying off, so you don’t end up with a noticeable line between one area and the next. Once you’ve started a panel, you can’t stop! Read more in the February 2019 issue of The Railway Magazine – on sale now!